SICOMETAL SNOW BLOWERS are unmatched by any other system. This is due to the typical shape of the turbine buckets, as technically most favorable to the transfer of the snow. The cutting edges of the buckets, sharpened, projecting from the deck of the turbine, running a real milling operation that can attack all kinds of snow and decreases an extraordinary resistance to progress. They feature a shell ejection mobile hydraulically, so that it can be oriented to eject to the right or left. These machines are especially suitable to keep the width of the lanes shoveling snow beads that accumulates on the edges of roads and highways. It is possible to adapt the end of the exhaust pipe, a fireplace rotatable 210 ° hydraulically facilitating the work in congested areas (option). This double turbine is ideal for removing snow from local roads, highways, airports, ski resorts and mountain roads. The combination triple output (optional), you can enjoy all the qualities of this machine maintaining a direct jet ejection snow right and left with a throw distance appreciable or go through a central fireplace hydraulically adjustable 280 ° to work in urbanized areas or perform work load. For the work of loading, it is possible to have a hydraulic valve at the end of the fireplace to better direct ejection in the truck bed (optional). The turbine slip on the pavement with these shoes wear steel (400 brinells) adjustable. For pavements with special coatings, it is possible to have a support roller in place of the wear shoe. It is also possible to have a roll of lateral support to lean against walls or rails for security (optional). Quickly interchangeable with a bow or a convertible snow plow with its standardized framework. Our turbines are studied side also set directly on agricultural trailer 3 points. They are driven by the PTO of the vehicle (100 to 300hp depending on model) or hydraulically. Mechanical safety of turbines and propellers icebreaker by shear pins. The HS 260 & 270 are provided with two shells ejection and movable hydraulically, so as to be oriented to the ejection to the right or left. Caps allow hydraulic guide rolls snow on the front. 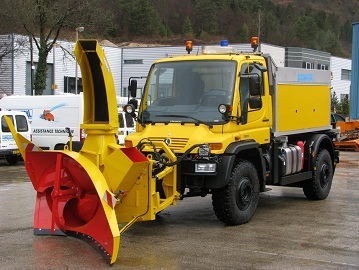 These machines are especially recommended for removing snow from roads, mountain trails and parking areas of airports, railways and large parking Ski. The HS 240 is a snow blowers with a central chimney-piece, adjustable to 280 ° hydraulically. It can be equipped with a hydraulic valve end chimney (optional). This double turbine is ideal for urban snow removal municipalities or mountain resorts. Intechangeable quickly with a bow or a snow plow. Quick hitch frame depending on the type of carrier. Wear blades bolted brinells 400.